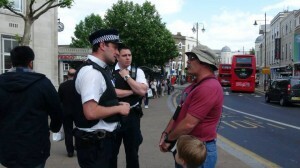 LONDON — An American evangelist was arrested and jailed this week in London during the Wimbledon Championships while preaching about sexual immorality on the streets. Miano was then told that he was under arrest and was asked to follow the officers uncuffed to the police station, which was five minutes away from where he was standing. The evangelist states that he was booked, photographed and fingerprinted, and police also took a DNA sample to ensure that he was not a wanted criminal. Miano outlined that he was later questioned meticulously by a detective about his beliefs. Police then concluded by asking Miano whether he believed he did anything wrong, and if he would make similar statements again when released. Miano replied by contending that he had done nothing unlawful, and that he would indeed preach the same message again if he felt led to do so by the Lord. After the detective and Miano’s attorney — Michael Phillips of Christian Concern — spoke, Phillips returned with bad news. Miano was then escorted back to his jail cell where he believed he would be spending the night. He began preaching and singing in his cell, and also asked his attorney if he could have a copy of the Bible. Miano said that after he received the Scriptures, he turned to the Book of Acts and began to find “great comfort” in the stories of the apostles who were also jailed for their bold preaching. However, much to his surprise, after some time, the detective came to his cell to inform him that there had been a change of plans. “He said, ‘The inspector has decided to release you with no further action,'” Miano recalled, shocked by the news. He was released near midnight after being behind bars for approximately seven hours. He concluded his blog by noting that he believes that America is not far behind the United Kingdom in regard to the criminalization of Christianity.